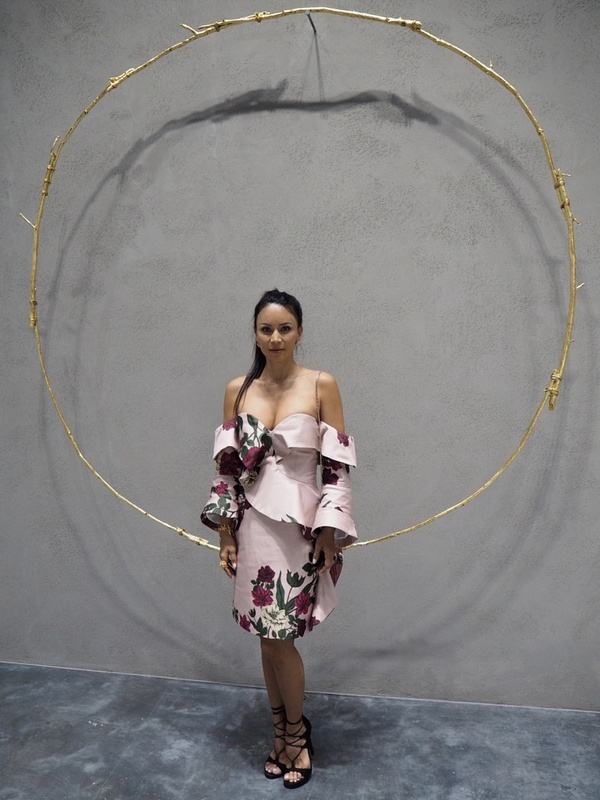 When I first arrived in Miami I was excited to celebrate the collaboration between jewellery maker MAOR Cohen and artist Olivia Steele at the multi brand fashion boutique store, The Webster. Steele is known for her creative text-focused structural pieces in neon and this collaboration didn’t disappoint. I love these one of kind creations, in particular a necklace that states ‘Embrace the Mystery’. Wise words for any fashionista! 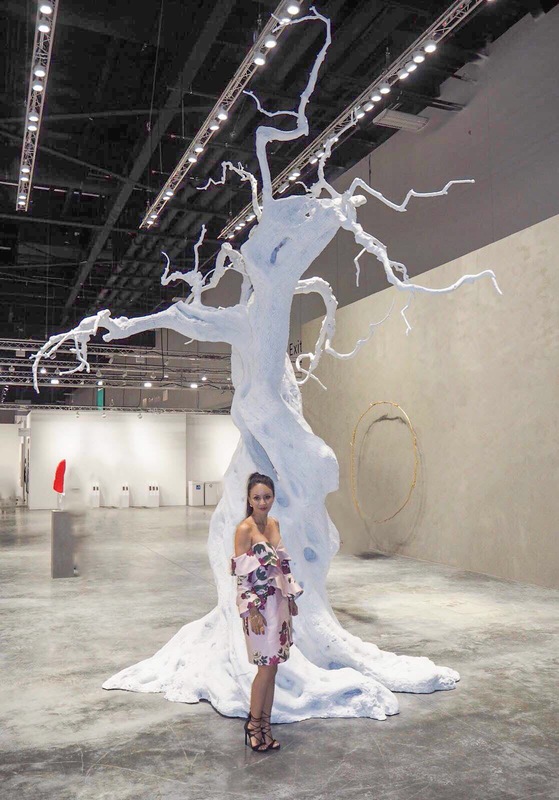 Incredible artworks and sculptures literally surround you during this exciting time in Miami and a lot of the new age artists are expressing their talents with street art. This amazing graffiti mural in the courtyard at Wynwood Walls took my breath away. This masterpiece created by Puerto Rican born Alexis Diaz depicts a dreamlike elephant with octopus tentacles. 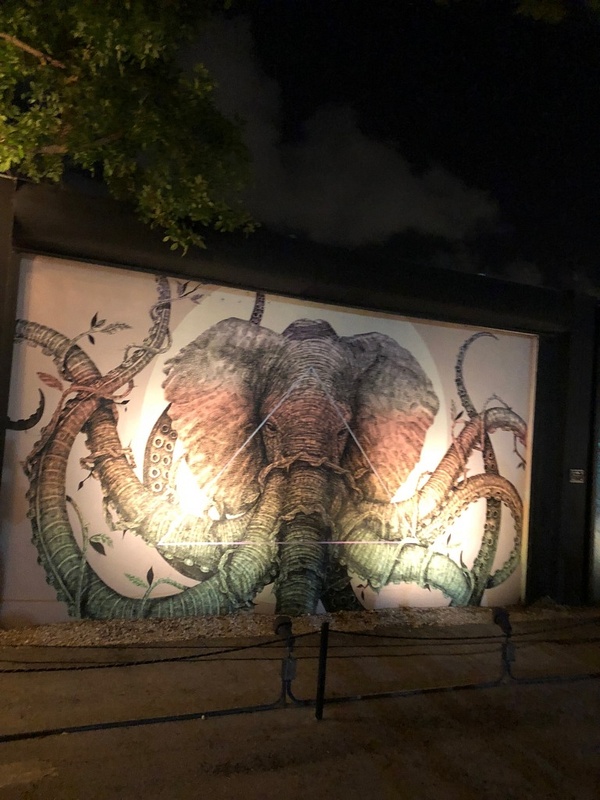 You don’t have to be in Miami though to catch a glimpse of this amazing artwork, as his animal depictions can be found in various cities around the world. It was such an honour and I had such a fun time at the Wynwood Walls VIP party. This was my favourite street art painting by the great Tristan Eaton aptly named ‘American Power’. It embodies female empowerment with these beautifully painted women’s faces. I’m wearing this gorgeous kaftan wrap dress. It comes from a collection that creates effortlessly glam beachwear pieces that can take you from beach to evening. How cute is this pretty little two piece? I loved wearing it to the launch of Moschino’s newest fragrance Gold Fresh, which comes in a mock gold Windex bottle. Jeremy Scott, creative director of Moschino, hosted the perfect evening, with a performance by Cardi B with Diplo on the turntables, all enjoyed in the good company of Paris Hilton and Joan Smalls amongst others. There are so many incredible pieces at artwork showcased over the long weekend that it would be impossible to choose a favourite artist. I’d like to share with you a couple that really stood out to me. I love the bright colours of the structural pieces by Do Ho Suh that I saw at the preview opening. This vibrant orange installation is enough to brighten anyone’s day! I wore this amazing off the shoulder dress, I love the ultra feminine ruffles together with beautiful floral prints. I thought the simplicity of this gilded bronze sculpture by the renowned Swiss artist Ugo Rondinone called ‘The Sun at 7am’ really made a big impact. Also presented by Galerie Eva Presenhubler is this incredible tree sculpture again by Ugo Rondinone. This piece is called ‘Hunger Moon’. The only way to get around Miami during Art Basel is hitching a lift in one of these super cute pink Moke jeeps sponsored by the Miami Design District. Barbie would definitely give her approval of this ride! I also brought the sunshine with me in this beautifully yellow off the shoulder dress with gold belt. The Eden Ball was such a magical and enchanted evening created and hosted by Perrier-Jouët. We entered through a dark passageway filled with luxurious foliage and enjoyed top entertainment from Ellie Goulding. I wore this absolutely stunning and sumptuously green dress. This bandeau style with the cinched waist creates such an elegant silhouette while the beautiful beading work creates the perfect red carpet dress. I complimented this luxuriously green dress with golden accessories. To finish off the long weekend of fabulous artworks I was delighted to attended W Magazine and Oliver’s People laid back beachy bash. This dress made the perfect outfit for a beachside party celebrating the New Wave Collectors at the Nautilus, a SIXTY hotel. It’s just the perfect amount of pretty, worn with a chunky golden bracelet and ring by Giovanni Raspini.